1. Roughly break up the chocolate into pieces, place into a bowl and add the butter. Place the bowl over a pan of simmering water, ensuring the bowl does not touch the water, and begin to melt the chocolate and butter. 2. Once the chocolate and butter has melted, take the bowl off the heat. 3. Pour in approximately half the cream and whisk in. Add the rest of the cream gradually and whisk until a smooth, shiny emulsion is achieved. Cover the bowl with clingfilm and leave to set in the fridge for at least 30 minutes. Chef’s tip: Once set, this can be used to make a rich chocolate icing for piping onto cupcakes. 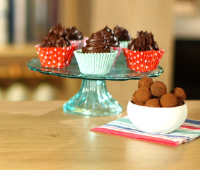 Or, make chocolate truffles by spooning small rounds of chilled ganache with a melon baller, coating in melted chocolate and dusting with cocoa powder. Leave back in the fridge to set and serve as an accompaniment to coffee or as petits fours. The ganache will keep up to three days in the fridge. This recipe was first published in Wed Jun 26 10:28:03 BST 2013.